‘Manmade’ isn’t a phrase you’ll find used often to describe landmarks in Devon’s Dartmoor National Park. It’s better known as an area of incredible natural beauty. However, Canonteign Falls is a place moulded by man that’s just as worth seeing as the glacier carved tors. We visited England’s highest manmade waterfall with our girls and Tin Box Dog and were not disappointed. 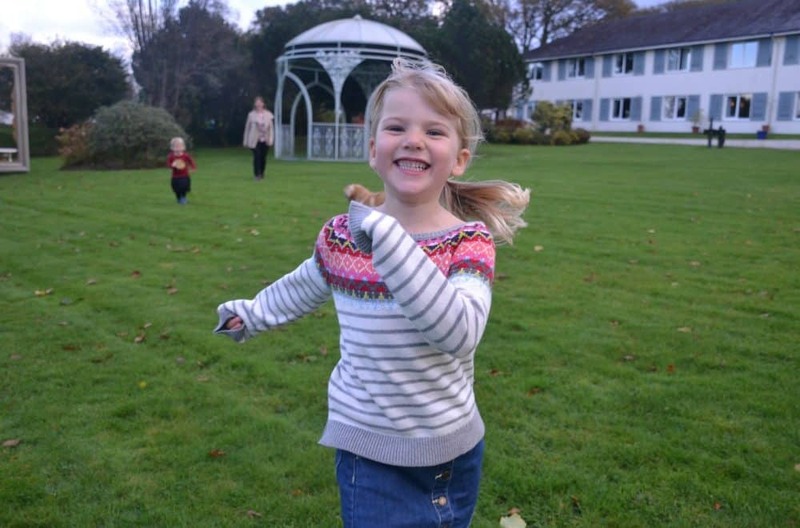 Here’s our experience of visiting Canonteign Falls with children. The Canonteign Estate was bought by the decorated naval officer Sir Edward Pellew in the late 18th Century. Mining came to the estate and the course of an existing waterfall was diverted to power the mine wheel. When the mining boom came to an end in 1880 the course of the water was diverted again over the nearby rock formation and through the woodland. This is when Canonteign Falls took shape. However the estate fell into disrepair because of the burden of death taxes. Restoration began in 1985 and continues today. Among the Victorian featured uncovered are 90 steps discovered in the 1980s. 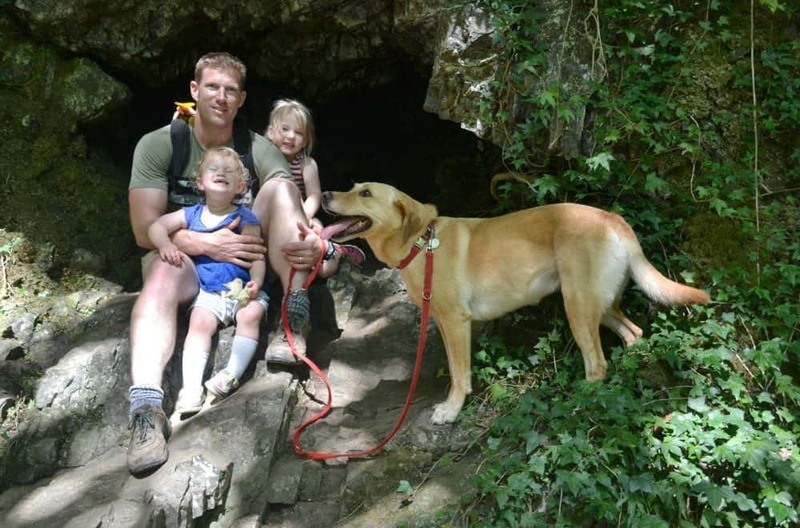 Today Canonteign Falls is open for the public and even four-legged friends to explore. It’s also the home to Exeter and District Model Boat Club which uses the main lake to sail its models several times a week. Depending on how your small adventurers are feeling on the day, I would say this is a good mini challenge for them. The walk up to the main fall and back takes about and hour, starting off with sloping path and progressing to a series of uneven steps. We tackled the route with our four-year-old walking and our two-year-old in our toddler carrier. Tot managed to walk the whole way with minimum assistance. There was lots to keep the girls’ attention during our walk. You can buy a children’s trail at the shop for £1 and solve the riddle of the woodland people along the path. This was a brilliant activity and helped us encourage Tot along the way. When you are half way up there’s also a set of 12 wiry fairies as well as fairy doors – a firm favourite with our two – between the Victorian Fern Garden and the top of the waterfall. These were beautiful, floating in among the trees like proper little sprites. On the way back down the hill the girls also spotted some woodland creatures sculpted from wood and metal. Right at the end of the walk was a mini assault course and zip wire for which our flagging little trekkers soon found plenty of energy. If you don’t take your own picnic the cafe at the entrance serves good value food. It also has children’s books and colouring to keep kids occupied inside. This is a challenging but rewarding walk to do with pre-schoolers, although various activities along the trail spurred our girls on. Tot walked the whole route with minimum fuss and Baby jumped in and out of the carrier when she wanted a closer look at a woodland person or fairy. The view from the highest waterfall, Lady Exmouth Falls, is a fair reward for your efforts to reach the top of the Canonteign Falls complex. This point, where the water tumbles out through a manmade gully, is called Buzzard’s View. From here the water plummets 70 meters down a rocky outcrop before flowing through fern-lined woods to a series of lakes where wildlife abounds. Prepare for a moderate climb with suitable footwear and layers to peel off as you go. The footpaths have a fair smattering of rocks and roots, and there are numerous reminders that the rustic fences were for guidance, not for leaning upon. This is definitely an attraction where pushchairs have to be left behind. So if you do take children who are likely to tire easily make sure you have a carrier or enough energy yourself to give them a piggyback. Also take some water. We visited on a very hot day and were gasping for ice lollies and cool drinks by the time we got back to the cafe at the entrance. 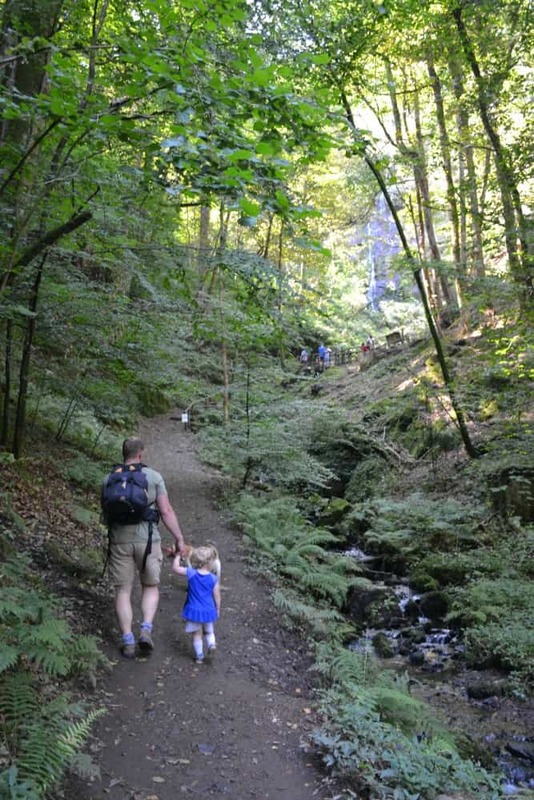 You can find out more about Canonteigh Falls opening times and entrance prices on its website. Have you visited Canonteigh Falls or do you know of any other waterfalls we could visit? I love the idea of creating your own waterfall – that is quite an ambitious project. Looks a fascinating day out though and love the activities to entertain kids on the way up. Sounds like an interesting day out. Do you think it would be a good idea to take the stroller along?